Supercomputers the size of sugar cubes? Believe it, IBM says. Researchers at IBM’s Zurich labs believe pioneering research into computers’ energy use and efficiency will soon lead to supercomputers shrunk to the size of a sugar cube, as scientists shift their focus to reduce the cost of running computers, not the amount it costs to build them. Dr Bruno Michel, a member of IBM ‘s Zurich Research Laboratory and his team have looked at ways of reducing computer power consumption, utilising water based cooling. The teams initial prototype, named Aquasar, is almost 50% more energy-efficient than techniques used to currently cool the world’s supercomputers. The BBC reports that almost 2% of the worlds total energy is consumed by building or running computer equipment meaning scientists clearly have their work cut out. 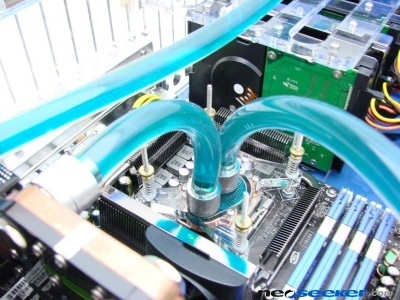 That said, the Aquasar prototype works by stacking computer processors on top of one another, using water to cool them as it flows between each one. Why use water? Mainly because it can hold 4000 times more waste heat than the same volume of air. Half a century ago, computer components were expensive, leading to high manufacturing costs. Now, transistors equate to 1/100th of the price of printing a single letter on a page, ensuring that the problem isn’t now how expensive a computer is to build, its how much the hardware will cost to power. For one watt of power, one of the top ranking supercomputers would be able to process 770 million operations. In contrast, the Aquasar prototype is able to clock 1.1 trillion operations, the team just need to find a way of reducing its size, currently the prototype is the size of a refrigerator. The challenge faced by Michel’s team is that the connections between stacked processors will need to work both as conductors and also be waterproof. The processors would be separated by water cooling channels no thicker than a human hair, the smaller the gap, the faster the speed, the smaller the size and ultimately lower running costs.